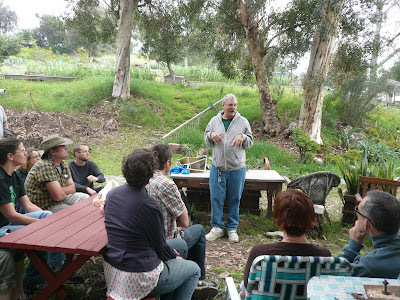 One of the first Backwards Beekeepers meetings at Solano Gardens. As many of you know, after five years the Backwards Beekeepers is going to disappear into the ether the same way it appeared. 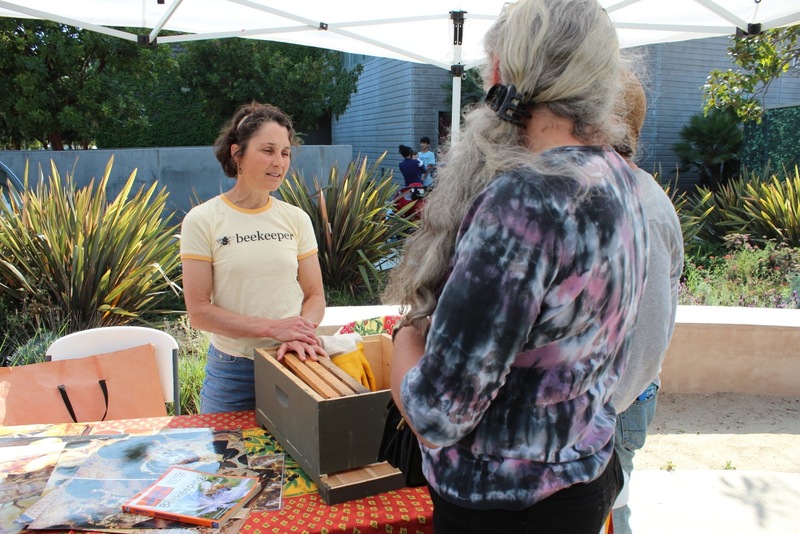 We helped thousands of people learn about organic, hands-off beekeeping and we are confident that the next wave of bee groups will be just as successful. Please join us for this last meeting, where we can celebrate a great run, introduce some of the new groups that have sprouted up, and thank Kirkobeeo for changing our lives. 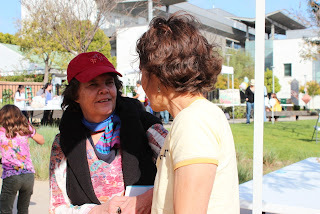 This blog will live on as an information resource. 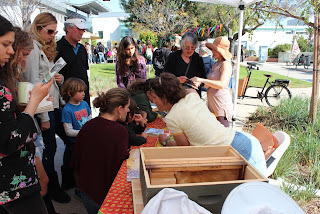 As usual, everyone is welcome to the meetings, especially those who are new to beekeeping. 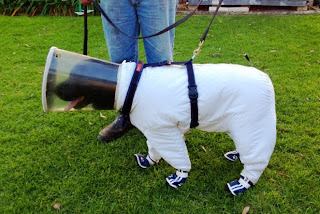 In the photo above is Bazz, a black labrador that beekeeper Josh Kennett has trained to detect by smell a serious bee disease called American foulbrood. The Paenibacillus larvae caused by the infection are usually only visible under high-magnification microscope, but thanks to Bazz, that's not necessary. Microscope analysis might not be needed thanks to Bazz's nose, but the dog still had to be protected from bee attack to get close enough to sniff out the hives. That's why Kennett built this protective suit that makes Bazz look a big like a canine astronaut. 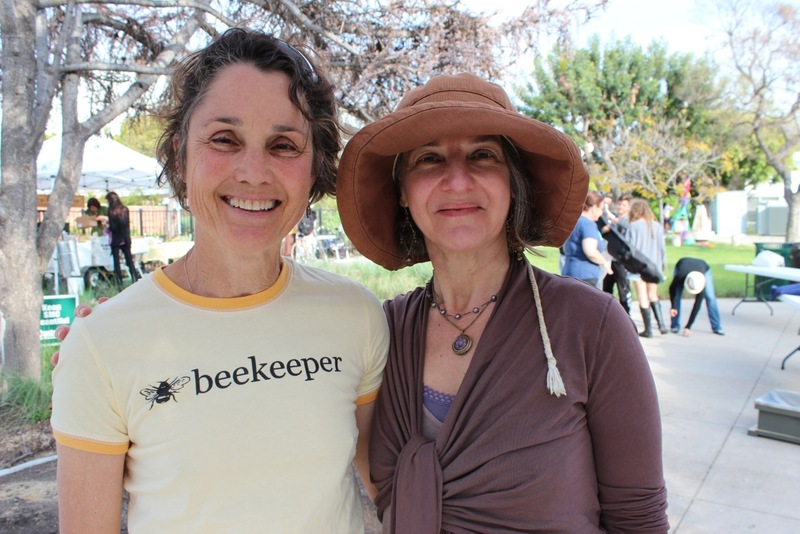 The Backwards Beekeepers took last month off and headed to Oregon for the Pacific Northwest Treatment-Free Beekeeping Conference. 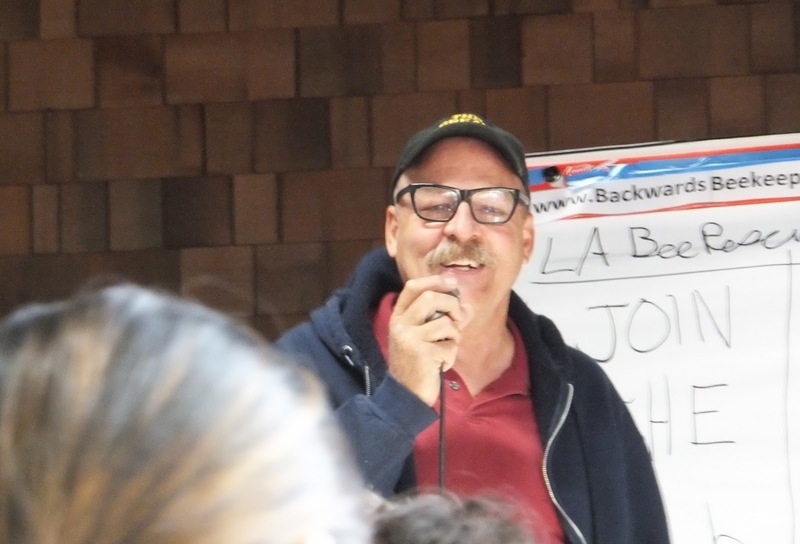 Yesterday, about 2:00, my next-door-neighbor Marty called, saying, "You've got a problem." We'd had a swarm of bees settle on our house. I love bees, but Marty was hiding in his house and a bunch of other neighbors were freaking out; there were going to be tons of people coming for the 4th on 4th Street. I found Backwards Beekeepers online. The person I spoke to doubted anyone was available on the holiday, but said he'd contact a volunteer who lives in Manhattan. Susan came over and voila! 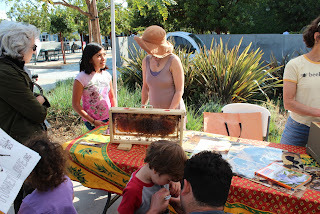 We learned about their group and all kinds of bee and hive stuff. So cool. The original group landed on the house, by the chimney. The cluster got bigger, spreading to the pittosporum, so we braced the branch out with a 2x4 to split it and encourage them to leave. They didn't. 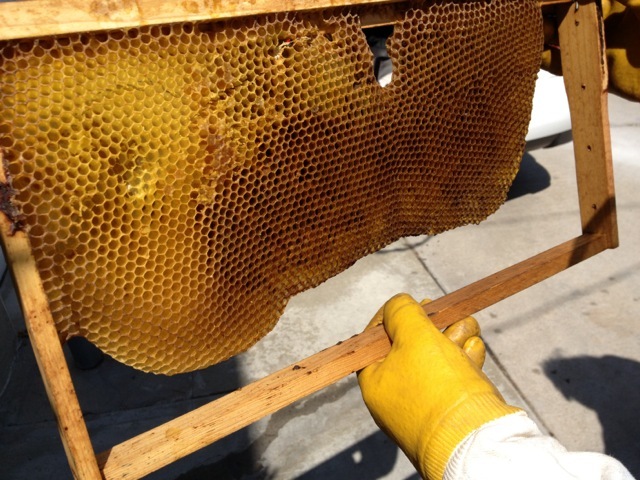 Marty was scared they were Africanized 'killer' bees, but they were harmless Western honey bees who, having outgrown their old hive, were looking for a home. Susan told us they assign and send out scouts. The remaining bees follow the scouts, clustering around the queen to protect her while they're outside and she's vulnerable. Because she's not built to fly, she tires easily and has to rest. That was what was happening here....they'd most likely stay overnight and move on in the morning to find a permanent spot where it was dark and the entry area was small and easy to defend (hopefully not our attic or between our walls). The queen is in the middle of the 'branch' group. The 'house' bees on the right eventually moved over to the branch. ....complete with a ready-for-occupancy bee condo, taken from one of her own hives. Her box holds 5 of these. The boxes we see on orchards each hold 10 each. You can see the bee 'bread' (their food) in most of the darker cells, and honey in the upper left, lighter area. 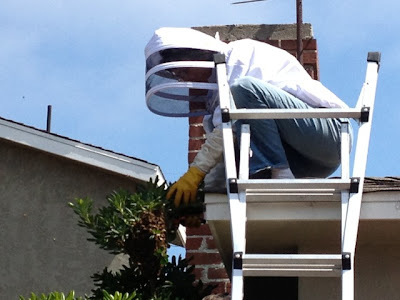 The 'tree' cluster turned out to be a good thing, enabling her to trim little branches away, then cut the top off and place it, along with the swarm, into her box. We both stood close by for at least 45 minutes without one sting. Apparently, regardless of where they are, all the bees return at night to rest, and that's the best time to move them. 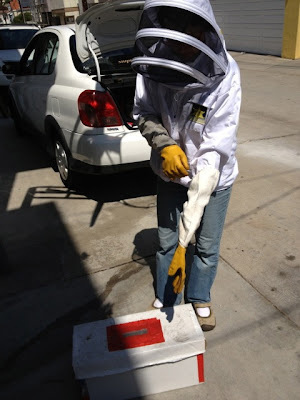 Susan returned at 9:00 pm and took the box to her house to start a new hive. 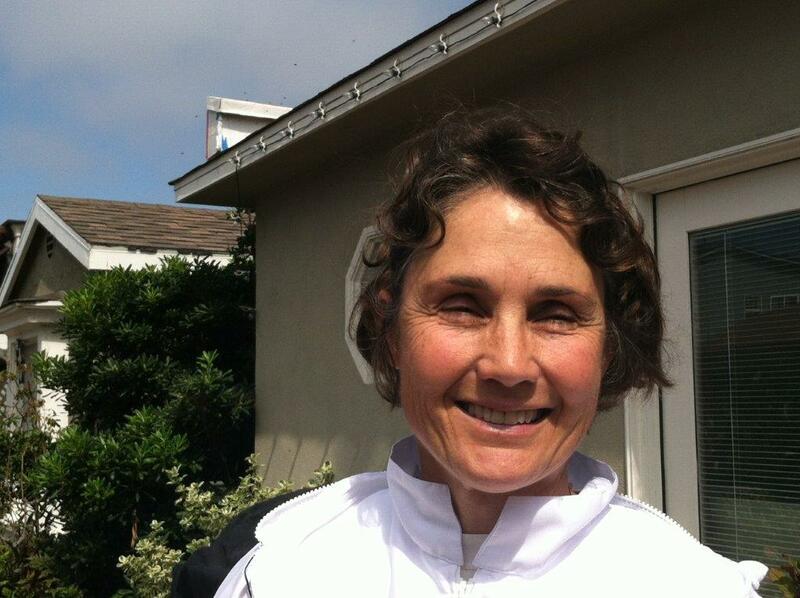 Susan said the city of Manhattan Beach refers calls to her. She told me my call was good timing; she'd just gotten up from a nap after going out at 3:30 am to collect a swarm on 12th St! Here's Susan with the portable box on the roof behind her. You can see some of the scouts returning. 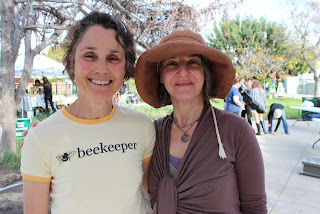 The next meeting of the Backwards Beekeepers is scheduled! This month our guru-in-chief Kirk Anderson will speak about Charles Martin Simon's principles of doing beekeeping backwards: how to inspect crowded hives, how to make sure your bees have room to grow and thrive naturally, and how, when beekeeping, to be simple and think like a bee instead of like a human. 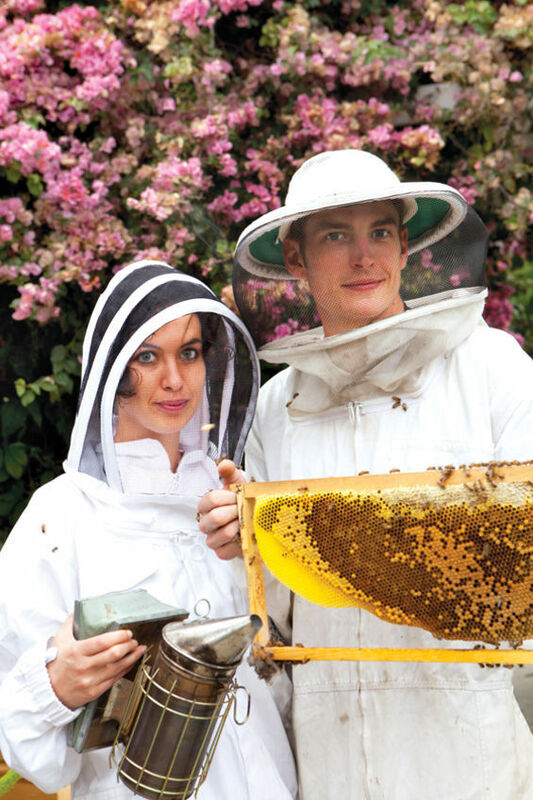 Rob and Chelsea (who also lead HoneyLove.org) are featured in an LA Weekly cover story about the Backwards Beekeepers. Also appearing: LA Backwards Beekeepers Kirk, Ceebs, and Max; LA City Councilman Bill Rosendahl; retired California State Supreme Court justice Carlos Moreno; Pizzeria Mozza; and more! Soon [Rob] started going on rescues, too — as many as three a day. He climbed a tangerine tree in the middle of the night and brought down the biggest open-air hive Chelsea had ever seen. 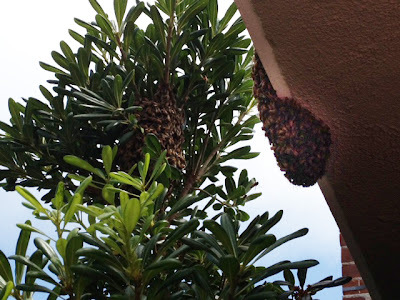 With a frenzied smile, Rob gripped the severed branch with massive honeycombs dangling off it — a 60-pound lollipop of bees. Chelsea snapped a picture. Then the dawning realization: "Where the hell do we put them?" It is a recurring question that will consume their next few days, then months, then years. 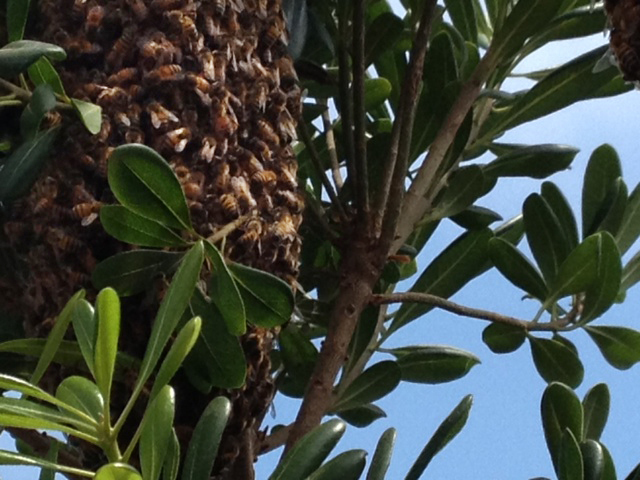 The tangerine tree hive sat on their roof for a spell. 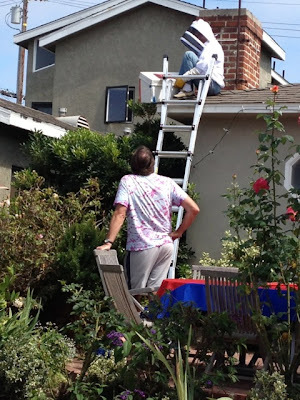 The McFarlands live in a modest house in the Del Rey neighborhood, a narrow, two-mile strip that cleaves Culver City from Mar Vista. They don't exactly have a lot of space. 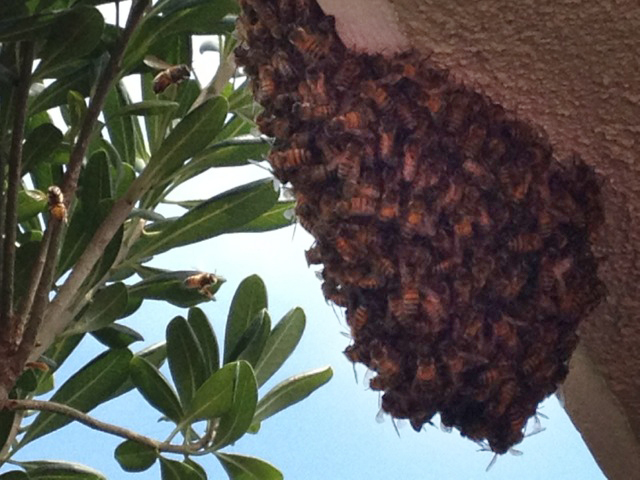 And what kind of neighbor welcomes a swarm? By some miracle, after weeks of shlepping hives across the city — after the crazy logistics of matching up people who had bees but didn't want them with people who want bees but didn't have them — Chelsea secured a spot: a small, scrubby hilltop in agrarian Moorpark, overlooking an organic farm owned by a friend of a friend. The McFarlands christened the hilltop the HoneyLove Sanctuary. Today it hosts 16 hives in colorful wood boxes, each from somewhere around L.A., rescued from water meters and birdhouses and compost bins, places Rob can't recall anymore. "Each one of these is a family," Chelsea says. "We're usually rushing to beat the exterminator out there." 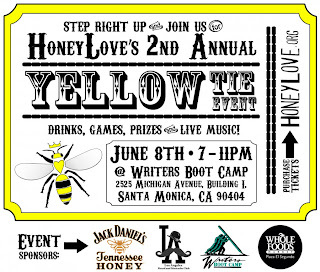 This month we're featuring an appearance by Sean Schwab, a longtime treatment-free beekeeper in Orange County. He's accumulated lots of knowledge about capturing and keeping feral bees, and will discuss the many misconceptions people have about them. Sunday morning our Surfing Group was surfing at Torrance Beach and noticed a beehive on the backside of the Torrance Beach Lifeguard Tower. 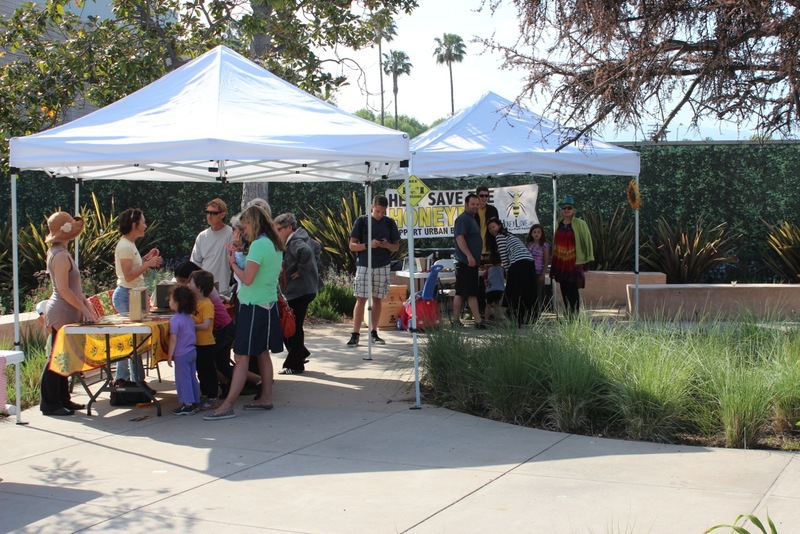 Bill Johnston, the Surfing Project Leader, notified the Palos Verdes Peninsula 4-H Club Bee Project and the project members made arrangements to meet at Torrance Beach at dusk to capture the swarm. The Bee Project Members have saved swarms before but never one on the ground, which is very unusual. As the Bee Project members further investigated, they noticed that the swarm had already begun to make a hive structure. They found the queen and put her and most of the other bees into a shoe box which we eventually put into a cooler to transport to John's Canyon in Rolling Hills. Some of us returned today to Torrance Beach to make sure our operation was successful! And it appears that it was indeed. 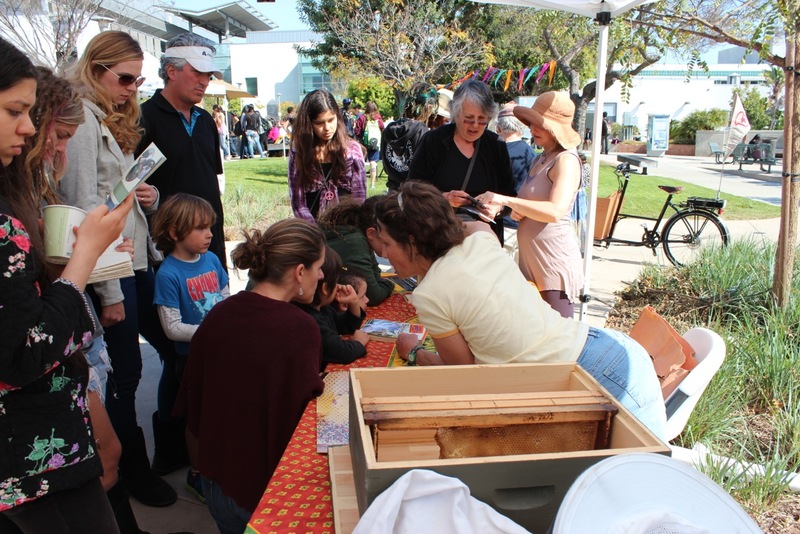 Our Bee Project members are very happy that they have been able to help the Community in these instances, and it has also given them a chance to educate the public in the value of bees in the environment. 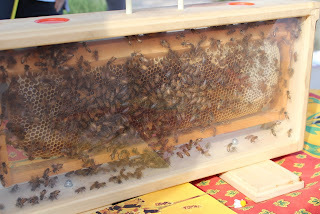 We need to be aware of preserving the bee population. We were happy to help the Los Angeles County Lifeguards and the bees as well. Check out these photos of Backwards Beekeepers at last week's Earth Day event at Santa Monica College!